12" Mosmatic shown with extension lance and castors. Small or large jobs, these pressure washer surface cleaners work great on cleaning boats, floors of all kind (most wood surfaces), bricks, roads and driveways. 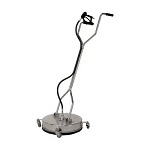 Depending on what you need, the Mosmatic surface cleaner is available in 8" and 12" diameter scrubbers with or without an extension lance constructed out of stainless steel for durability. 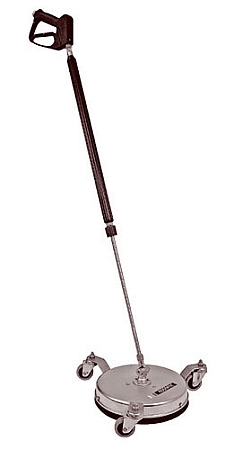 Removes dire up to 15 times faster than standard wands. A built-in brush skirt to prevent overspray. Minimum moving parts which means less to maintain. Turn water on and open valve. Open trigger gun for flow of water through nozzles. Nozzles must have flowing spray. If not, remove tips and clean; reassemble, making sure that groove of nozzle is parallel to spray bar. Use Teflon tape when installing nozzles. Start Pressure Washer. The flat surface cleaner is ready for operation. 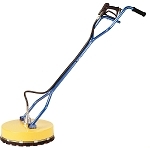 Walk slowly behind the flat surface cleaner, cleaning as you go. If striping occurs, slow down your pace. Periodically check weep hole on bottom of swivel. Water will seep slowly; if water shoots out, stop and replace seals. Swivel assembly can be rebuilt. For maximum effectiveness keep spray nozzles clean. If the machine vibrates, stop and clean spray tips. Lubricate swivel with one squirt of good quality grease every 200 hours of operation or about once a month if used daily. A small amount of grease coming out of the bottom of the swivel is normal. DO NOT ALLOW MACHINE TO REMAIN STATIONARY ON SOFT SURFACES, SUCH AS WOOD. CAUTION: Striking any raised obstacle during operation will damage machine. If contact does occur and results in vibration when operating machine, STOP and replace spray bar. Continued operation could result in serious injury or damage to machine.